As much as I love America, there is one thing food-wise, that I haven’t gotten used to in almost twenty years: salad dressings! Besides the fact that most store-bought dressings include a lot of processed ingredients, I find that most of these concoctions (even when home-made) combine so many different flavors that they hide, rather than enhance, that of the salad itself. Another issue is texture: most dressings are so thick that, rather than enveloping the leaves, they sit on them. 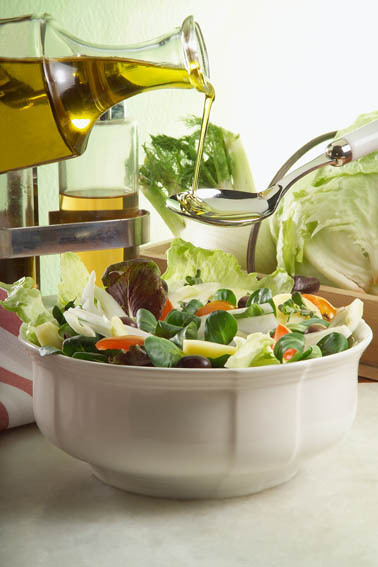 In Italy, we dress salads very simply with oil and vinegar, or oil and lemon,and in some cases just oil and salt, in a similar way to the French. The proportions are simple: one part of vinegar or lemon to 4 of oil for a milder dressing, or one part of vinegar or lemon to 3 parts of oil (and some salt) if you like tart flavors. Most Italians don’t actually measure, but you should calculate about 1 1/2 to 2 tablespoons oil per person, or just 1 if you are on a diet. Skipping oil altogether and going fat-free is not as healthy as it sounds, because some of the vitamins in vegetables are lipo-soluble and can only be absorbed when accompanied by a fat. Choosea nice extra-virgin olive oil, and not the cheaper, “light” varieties. As for vinegar, balsamic is very popular these days, but its complex flavor works only with very flavorful vegetables and can be overpowering on simpler types of lettuce. Simple white or red wine vinegar is much more versatile, as is lemon juice. Other great options are apple cider vinegar, and rice vinegar. I must confess that most of us don’t even bother to blend the ingredients for our everyday meal. Right before eating the salad, we just sprinkle with salt, and pour some oil and then vinegar straight from their bottles. But this is not necessarily the best method, and you should blend the ingredients first for a better result.Everybody knows that vinegar and oil do not emulsify well and tend to separate. The best way to combine them, reducing them into micro-droplets, is in a blender. Honestly, I only do this if I have guests. For everyday, I just put the salt in a stainless or glass bowl, add the vinegar or lemon (do not add the salt after the oil, or it won’t dissolve), and combine well with a whisk or simply a fork. 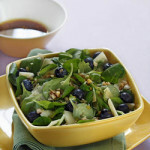 Gradually add the oil, whisking well, and use immediately to dress a salad. The ingredients should be at room temperature, and never cold, or they won’t blend well. 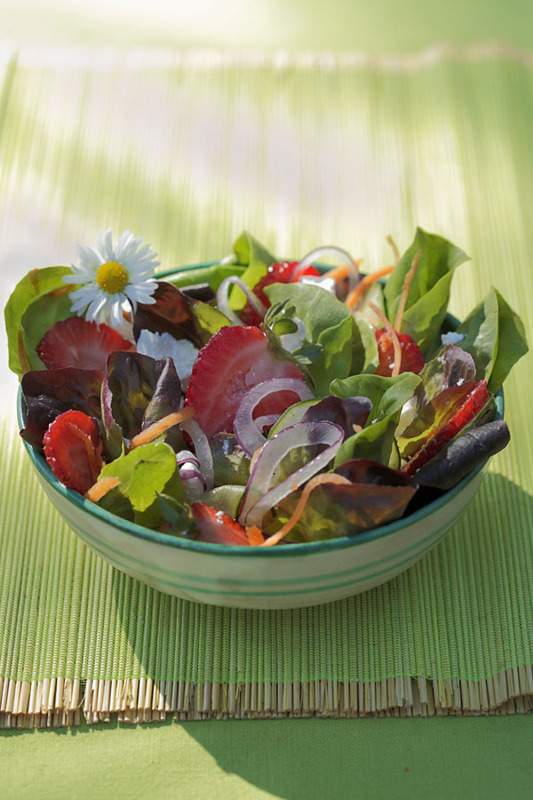 Remember that you should never dress salads in advance, except for very “resistant” vegetables such as cucumber or radicchio – delicate salad leaves tend to react to vinaigrette and wither. Sometimes, when I want my salad to be really special, or if I need to plate it for a picture, I add a touch of honey to the dressing: honey stabilizes the emulsion for a long time, so that the oil and vinegar will not separate all over the plate.If you do use your blender and add honey, it’s actually best to let the vinaigrette rest for a few minutes or even an hour before using it, so that all the flavors can meld; but don’t refrigerate it!Last, but not least: even if you are using bagged salad, always rinse it first – not only because… you never know!!! but also because if the salad is too dry you will end up using way to much dressing. Buon appetito, and let me know how it goes! 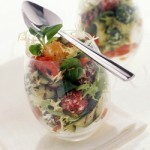 With a wet melon ball cutter or with your wet hands, shape the goat cheese into little balls . Roll 1/4 of them into the freshly grated green peppercorns, 1/4 into the chives, 1/4 into the pink peppercorns and 1/3 into the grated carrot, then place the cheese balls in the refrigerator to harden. 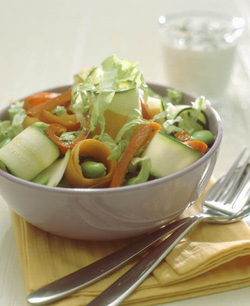 Wash the pepper and zucchini; cut the pepper into thin strips after discarding the seeds and white membranes; cut the zucchini into thin slices lengthwise (with a mandoline if possible). Grill the zucchini and peppers on a heavyweight grill pan (I like this ). Wash the endive and cut it into pieces. 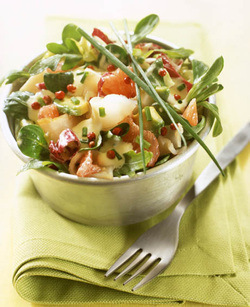 Gather all the ingredients in a large bowl and dress with the olive oil mixed with a little salt and pink pepper. 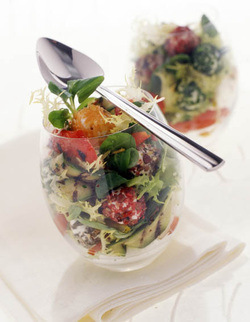 Stir gently and serve in individual bowls or cups. Cut the lettuce into thin stripes. Seed the pepper, remove the white membranes and cut it into strips. 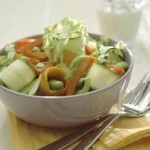 Slice the carrot and the zucchini length-wise, into very thin slices (you can use a mandoline, or a potato peeler). 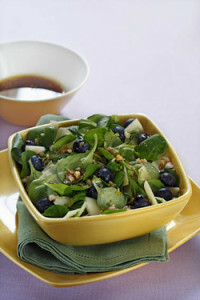 Gather all the ingredients in a large bowl, add the fava beans, and dress with the olive oil mixed with the lemon, the salt and the pepper (if using pre-washed packaged salad and it’s a little dry, add a tablespoon of water). 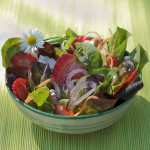 A super-fresh and delicate salad to celebrate the arrival of spring! When using edible flowers in your food, make sure they are not treated with dangerous chemicals. The best are the ones from your own garden! Peel the onion and slice it very thinly, then soak in a bowl of ice water for at least 20 minutes (soaking the onion in ice water tames the bite and makes it more digestible by washing out the sulfurs). 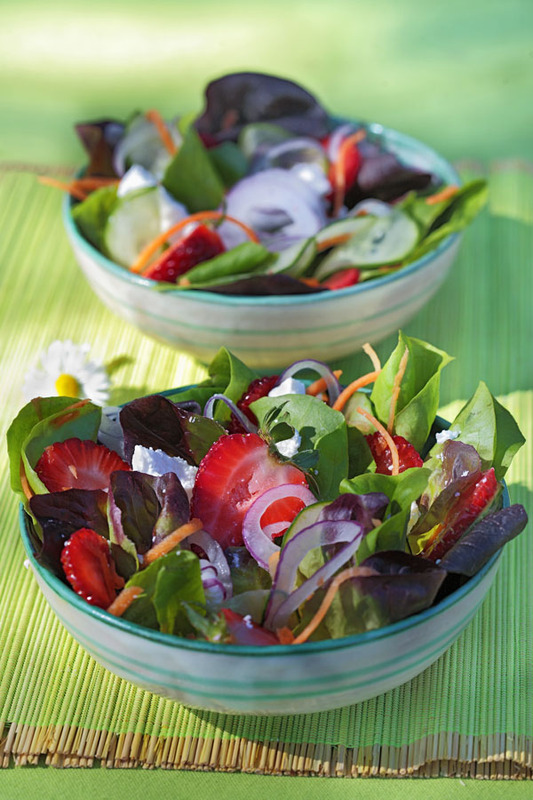 Wash and dry the two types of lettuce; wash the strawberries and slice them thinly. Peel and shred the carrot. Drain and dry the onion, and combine everything together in a bowl. 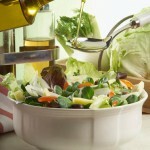 In a cup, mix together the oil, vinegar, salt and pepper: pour the mix on the salad and toss. Add the cheese if using. You can decorate it with fresh flowers. I just gave a demo on healthful and elegant Italian cuisine at the JCC Manhattan during their Fitness for EveryBODY Fair. 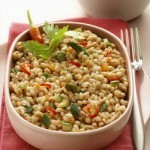 One of the ingredients I presented was barley, a grain with many beneficial properties. Unlike wheat, it contains a high amount of soluble fibers (betaglucans), which have a positive effect on cholesterol and provide an immediate sense of satiety, which will be appreciated by those of you who are trying to keep their weight in check. It also contains many vitamins, minerals and antioxidants and has been shown to help liver and kidney function. What’s not to like? This way of cooking barley, with the same technique that Italians apply to rice in risottos, is typical of Friuli-Venezia Giulia, in the North-East, and I learned it during my year in Trieste. 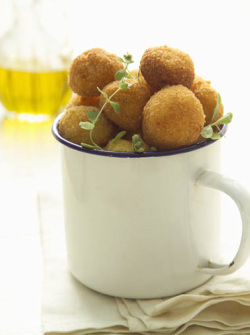 Heat 2 or 3 tablespoons of extra-virgin olive oil in a heavy-bottomed or non-stick pot over medium heat. Add the onion, and sauté until translucent, adding a tablespoon of water if it starts sticking to the bottom. 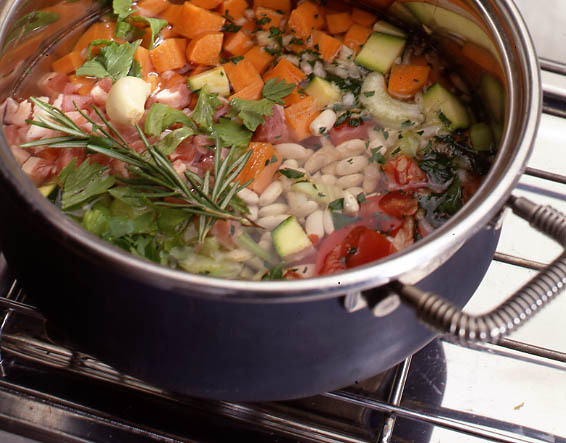 Add any of the vegetables that require a longer cooking time, such as carrots, peppers or potatoes, and cook stirring for 4 minutes. 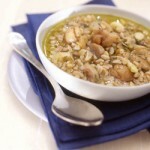 Add the barley, and cook for 2 minutes on higher heat, stirring . Add the wine, and allow it to evaporate. Season with salt and pepper, and begin adding the hot stock ione or two ladlefuls at a time, stirring frequently, and adding more stock as soon as the liquid is absorbed. 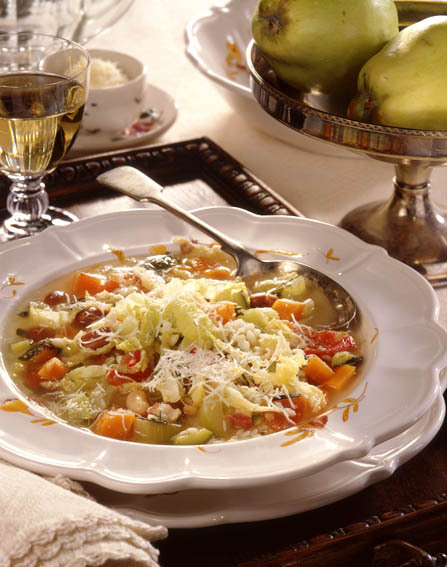 After about 10-15 minutes add the diced zucchini and/or asparagus (or any quick-cooking vegetables) and keep cooking, stirring and adding hot stock, until al dente, about 30-35 minutes. It should be creamy and not too thick: add enough liquid. When cooked, remove from the heat, season with more salt and pepper, and drizzle with 1 tablespoon of your best extra-virgin olive oil. If you are eating dairy, add about 1 to 2 tablespoons of freshly grated parmigiano or grand cheese, and serve immediately. We just came back from ten days in Italy, mostly spent in Venice hanging out with my mom and childhood friends. But my husband and kids had never been to Florence, and I decided to treat them to a couple of days in the cradle of the Italian Renaissance. The highlight of our stay was a lunch at our friends Alberto and Giordana’s apartment, with a breathtaking view of Fiesole and the Tuscan hills; followed by rides on the carousel in Piazza della Repubblica for our two kids! 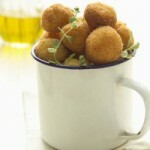 The food in Florence and in all of Tuscany is fantastic, simple and elegant, and justly famous. 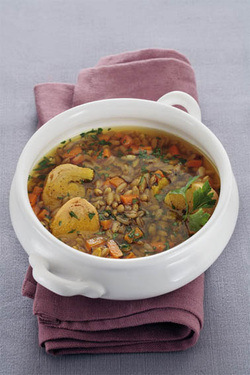 If you are not planning a trip any time soon, why not try this easy and delicious soup in your own kitchen? 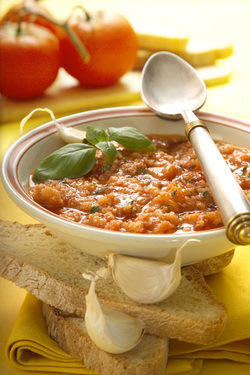 Pappa col Pomodoro is a perfect example of Italian “comfort food”, and of Tuscan peasant cooking. 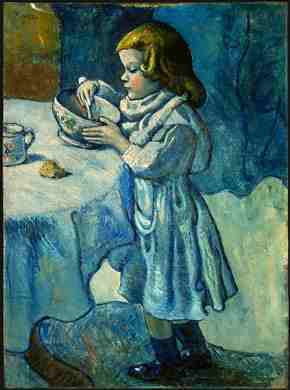 Bread soups were born of necessity: people could not afford to throw away stale bread, and devised ways to make it not only edible, but wonderfully tasty. Be warned that American-style soft sliced bread would just turn into a slimy and sticky mess: you will need artisanal bread with a firm, rough crust. The best types are Tuscan or Pugliese loaves. I live in Manhattan, and love Tribeca Oven. Slice the bread. In a heavy pot, heat the 2 tablespoons of olive oil and add the garlic. 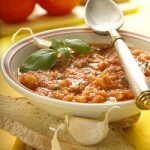 After a couple of minutes discard the garlic, and add the can of tomatoes, breaking them with your hands into the pot. Add salt, pepper, sugar and water, and stir with a wooden spoon. Shred the bread into bite-sized chunks with your hands (if it’s too hard/dry cut it into cubes with a bread knife), and add them to the pot. Do not stir too aggressively, because you don’t want the bread to melt into the water completely: the texture should be somewhat chunky. You should stir gently using an upward motion, and not too long. Cook on low heat for about 30 to 40 minutes, stirring occasionally. 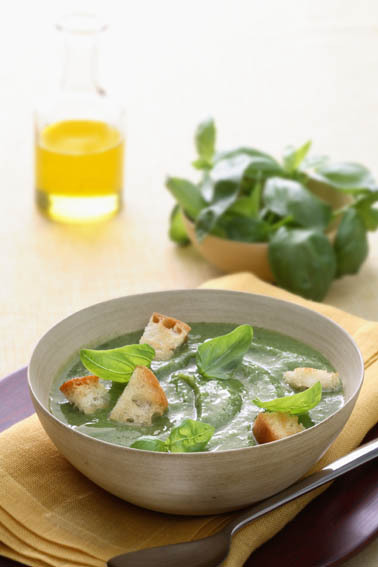 Shred the basil leaves and add them to the soup; drizzle with more olive oil (about 1 tablespoon per person), lightly toss, serve. 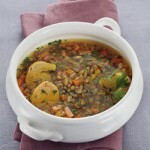 This soup tastes even better reheated: it will be so thick that you will be able to eat it with a fork. Enjoy! 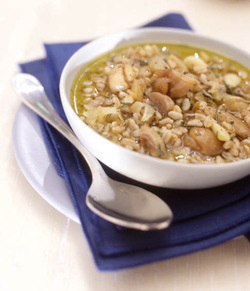 Have you ever tried KAMUT? It’s a long grain with a brown cover – it looks similar to brown rice, but it’s related to wheat and has a velvety, nutty flavor. 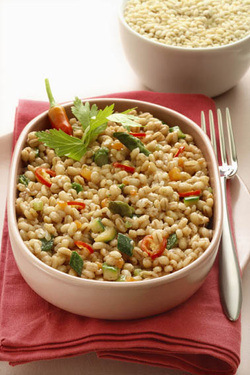 It’s richer in protein than wheat, and contains several vitamins and minerals. Perfect for a winter soup! The other main ingredient of this “minestra” is saffron, the star ingredient in Italy’s favorite risotto Milanese, and in many festive Sephardic dishes. Saffron, one of the most highly prized spices since antiquity, and a native of the Southern Mediterranean, is now cultivated in many countries. 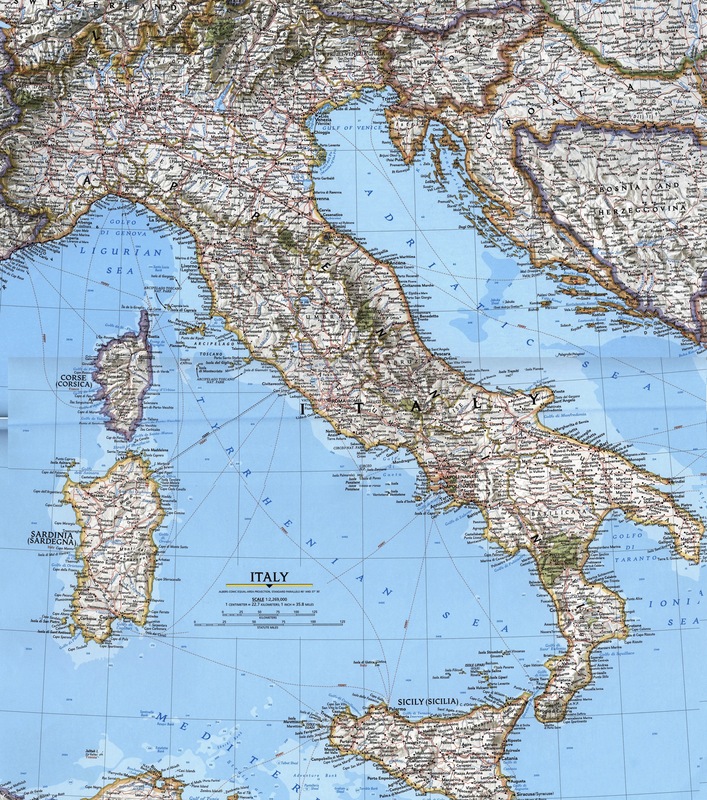 However, some the best in the world is said to be produced in the Abruzzi region of Italy, a couple of hours east of Rome – a legend says that it was first smuggled here by a dominican monk in the 13th century, and the production has been thriving ever since. In order to maintain the intense aroma of their saffron, the locals uproot the bulbs yearly, and select them for size. 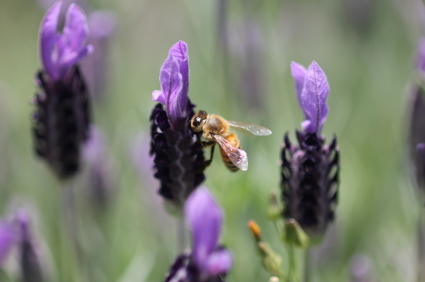 The perfect soil and climate conditions do the rest, and every fall the flowers are harvested. About 80,000 crocus flowers are needed to produce a meager pound of saffron – in case you wondered what makes it the most expensive spice in the world! To justify the extravagant expense, remember that saffron has been used as a medicinal botanical on many continents throughout history, and some recent research has demonstrated that one of its components shows promise as an anti-cancer agent. Brew the saffron in a few spoonfuls of hot water. Chop the onion, celery and carrot finely (we call this mix “soffritto”). Heat 2 tablespoons of olive oil and cook this vegetable mix in the oil for 5 to 10 minutes. Cover and allow to simmer on low heat for 30 minutes. Add the saffron and allow to cook for about 10-15 more minutes, or until the kamut is cooked “al dente”. 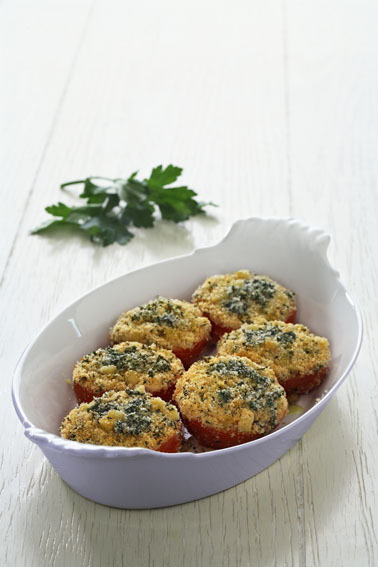 Drizzle with a little more olive oil, add a dash of pepper and some minced parsley, and serve. Whisk the oil with the lemon juice (and yogurt, if using); add the chives, salt , grated grapefruit zest, and pink peppercorns and mix well. Peel the grapefruit eliminating all the membranes, and divide it into slices; wash and drain the 3 different types of salads, and cut them into stripes. 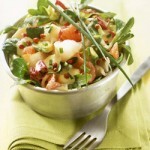 Place them with the grapefruit in a large bowl and toss with the dressing. Peel the avocado, cut it into thin slices, drizzle it with lemon juice (to prevent it from oxidizing). Cut the smoked fish into stripes. Add the avocado and fish to the salad and serve. Before the advent of industrial baking products, many of the treats that our grandmothers served during the week included fruit. 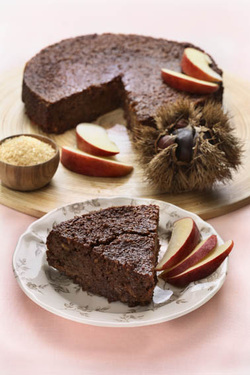 Compotes and baked fruit are a delicious way to indulge our sweet tooth without overdoing the sugar and the calories, and actually adding nutrients to our diet. 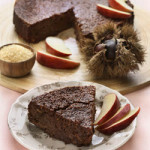 Baked fruit, in particular, is easy to make and very comforting in the frosty fall and winter days. 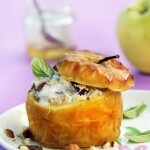 Cut off the tops from the apples and set them aside, sprinkling the inside with lemon juice. Core the apples from the top down, using an apple corer or melon baller, taking care not to pierce the bottom (leave about 1/2? pulp on the bottom and sides). Place the apples in a baking pan just large enough to hold them. Dice the pulp you extracted from the apples (discarding the hard cores and seeds), and place it in a bowl with little lemon juice, the hazelnuts, the honey and the yogurt, combining well. 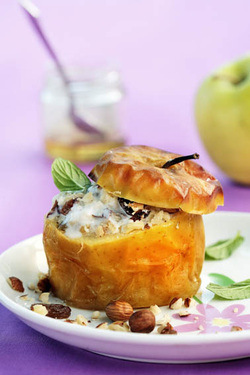 Sprinkle the inside of the cored apples with brown sugar, and stuff them with the yogurt/apple/hazelnut mix. Cover them with the tops that you had set aside, and bake at 375 F for 30 minutes (more if you like very soft apples). For a more fragrant recipe, you can stick a couple of cloves into the peel of each apple before baking. Often we forget to eat healthy foods just because we are so busy. On top of that, fish can be quite intimidating to people who have never learned how to cook it. 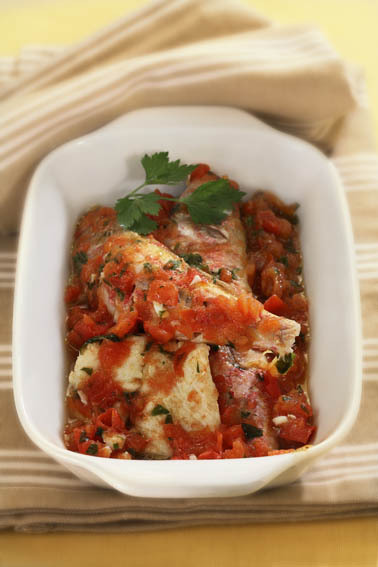 This recipe, however, is easy to prepare, looks very pretty, and it tastes great. 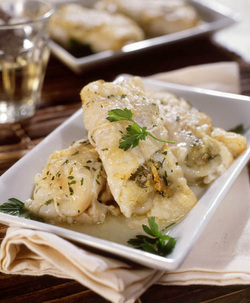 Tilapia and sole are light, flaky, white-fleshed fish – a perfect low-calorie source of lean protein for those of you who are watching their waistlines or at risk of cardiovascular disease. The extra burst of flavor comes from anchovies, herrings’ “little cousins”: just like their larger relatives they are chock-full of nutrients (for example, they are a rich source of protein, niacin, calcium, selenium, and an extremely high concentration of omega-3 fatty acids), and one of the most beloved ingredients in Italian cuisine. Soak the diced bread in 4 tablespoons of cold vegetable broth or water for a few minutes; drain well squeezing the liquid out. Combine in a food processor with one tablespoon oil, parsley, capers, anchovies, lemon zest (you can also mix everything together with a fork). Season the fillets with salt and pepper, dredge in flour shaking off the excess. Put some of the filling on the center of each fillet, roll the fillet around the filling and secure with a toothpick or tie with string (for an ever prettier effect, blanch some chives in boiling water and use them as strings). Repeat with all the fillets. 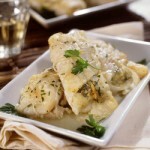 Heat the remaining oil in a pan and add the fillet, seam down. Cook for about 5 minutes, turn carefully with a spatula; cook the other side for a couple more minutes, and add the wine. 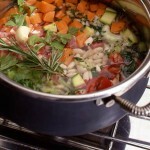 Turn up the heat to allow the wine to evaporate, and voila'! *** if you are really watching your waistline and need to decrease the quantity of the oil, you can just bake these in a parchment-lined pan, brushing the top with a mix of 1 tablespoon oil and 1 tablespoon lemon. You can also steam them and drizzle them with little oil and lemon at the end. In both cases, skip the flour. 10 ounces firm cheese (if using Italian cheese, a montasio or asiago; if using a local cheese, a medium cheddar would work). 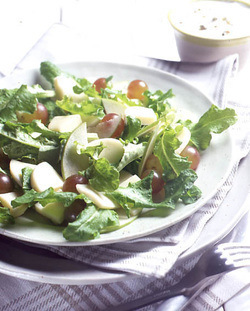 Clean and wash the salad and grapes; wash and core the apple, and cut it into very thin slices. Cut the cheese into small cubes. Peel the garlic, mash it and combine it with the yogurt; add the oil, salt and green peppercorns. 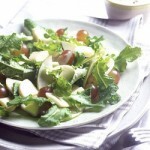 Arrange the lettuce in a large bowl or platter with the cheese, apple and grapes on top, and serve with the yogurt sauce. I’m going to let you in on an Italian secret: while gelato is delicious, most of us don’t eat it every night! Our sweet treat after dinner is usually just fresh fruit, especially if the main courses are rich. When we have guests we often serve Macedonia, a simple salad made with a variety of fruit cut into small pieces, so that when you put a spoonful into your mouth you can taste a combination of different flavors. Macedonia is dressed very simply with fresh sugar and lemon juice – or Prosecco if no children are present! 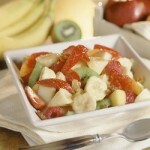 This is just a sample recipe, but the possibilities are endless – just pick your favorite fruit! Make sure you sprinkle with fresh lemon juice right after slicing, or bananas and pears will oxidize quickly. I prefer not to use apples, because their texture is much crunchier than most other fruit. Cut all the fruit into small pieces (the smaller, the better!) and mix well with the lemon (and raisins, if liked). Add the sugar and mix in. Refrigerate before serving. 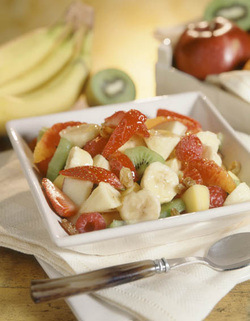 * This is just an example, you can use any fruit you like!